In the war your home wages against the elements, the gutter system serves as a first line of defense. If a section gets damaged, act fast to replace it—before the next storm hits! Wind, rain, snow, hail and falling tree branches can wreak havoc on your rain gutters. After an especially severe storm, if any section of guttering appears damaged beyond repair, you can always replace that one part of the system. It’s a relatively straightforward job. Here’s how it’s done. Once you’ve got your ladder safely positioned under the damaged section, use a screwdriver or a pry bar to remove the gutter hangers (assuming they can be reused). Then, with a hacksaw, cut away the section you wish to replace. Before you do so, however, consider wedging 2×4 spacers into the adjacent guttering; that way, you can be sure those sections keep their shape while you’re working. Now, cut the new section to size, allowing for about two inches of overlap on either side. 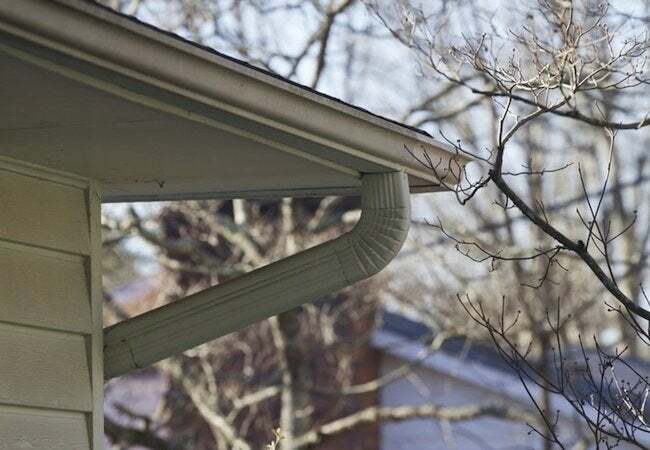 (Note that it’s often easiest to cut gutters when they are upside down, and that it can also be helpful to position a spacer within the gutter you’re cutting). Finally, proceed to add the new section into the gap. Having cleared away leaves and debris, apply caulk at the seams where the replacement section joins with the existing gutters. Install rivets, reinstall the gutter hangers—and you’re done!